Dr. Hermes Camacho is a composer, conductor, and violinist based in Austin, Texas. His music has been performed throughout the United States, Canada, Europe, and Australia and has garnered awards and recognition from the National Endowment for the Arts, Meet the Composer, American Composers Forum, ASCAP, Society of Composers, ArtsAha!, and the Vermont Arts Council, among others. Camacho has over 150 conducted performances to his credit in a variety of genres and ensemble types, including a performance for a delegation of 45 Ambassadors to the United Nations and a nationally televised broadcast performance for the 2013 Mexican Independence Day festivities in Austin. 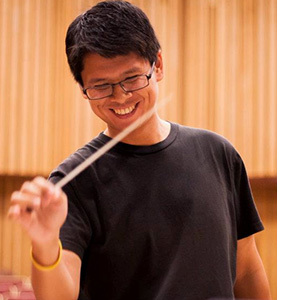 After his freshman year in college, Camacho was invited to serve on the faculty of the Sacramento Youth Symphony, primarily conducting their summer chamber workshop orchestras, coaching small ensembles, and overseeing the Composer-in-Residence program. He is currently on the teaching faculty of Austin Soundwaves, an El Sistema USA youth music program benefiting the underserved area of East Austin, Texas, where he leads the symphony orchestra and music theory programs, as well as teaching band, strings, and chamber music. Camacho is also Co-Founder of Picardy, a music theory webapp, and is serving a term on the Music Theory Outreach Committee as part of an association with the Society for Music Theory. His scholarly work focuses on emerging pedagogies, with emphasis on gamification, and edtech, having most recently presented workshops and a posters at the Journal of Music Theory Pedagogy Conference. Originally from California, Dr. Camacho earned degrees from Cal State Long Beach (B.M. ), the University of Colorado at Boulder (M.M.) and the doctorate from The University of Texas at Austin in 2011.